Andrew and Justin discuss the curious case of\Ghost Robber. Debate the likelihood of the new iPhones ushering in an era of Apple Virtual Reality. Andrew admits he’s looking forward to writing on his new Apple Watch. The boys look forward to the release of Andrew’s book Angel Killer on September 23rd. Florida rides a double-edged sword. On one side people proclaim it’s a great place to vacation. On the other side are the people who live there who are completely aware of the fact that it’s just wet sand covering a giant Hellmouth. Seriously…the sky tries to kill people with bolts of lightning, the ground tries to swallow anything that lives on it whole and the things that crawl around aren’t like things that crawl around anywhere else. A fisherman off the coast caught the Face-Grabber’s cousin the other day. It’s called a Mantis Shrimp…and the one that was caught (at night we’d like to add) is bigger than most (and probably a sign that something’s also happening in Florida’s water because…well…it’s Florida). Imagine if you rolled a predator, one of Ridley Scott’s aliens, a mole person, a little bit of a Grim Reaper and a highly skilled ninja into a living animal and slathered it in ugly. 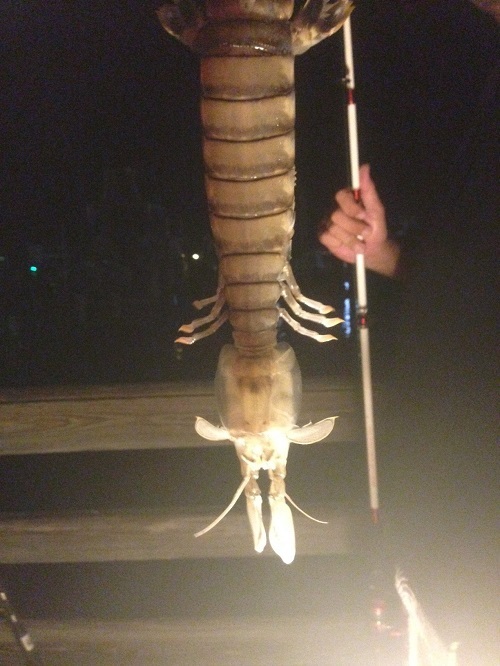 Florida’s Fish and Wildlife Commission posted a picture of a super-sized one of these nightmares on their Facebook page and it’s gone viral with good reason…it’s terrifying and it lives in the sand…under your feet. Next time you think about exploring Florida because you’re bored of the theme parks? Just…here watch this and imagine one of these about 7 times the size of the one in the video…and crawling up your leg. You are currently browsing the Weird Things blog archives for September, 2014.